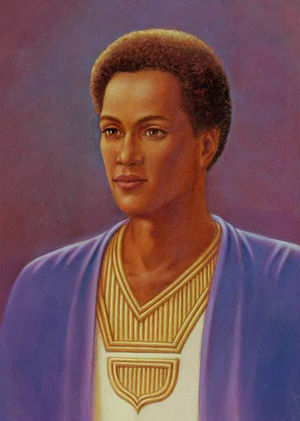 Difference between revisions of "Afra"
'''Afra''' was the first member of the black race to make his ascension. Long ago, he offered name and fame to God to sponsor a vast continent and a mighty people. When he ascended, he asked to be called simply “a brother” (''frater'' in Latin), hence the name Afra. The continent of Africa takes its name from Afra, and he is the patron of Africa and of the black race. There were ancient [[golden age]]s in Africa when it was a part of the continent of [[Lemuria]], when the people came forth out of the light of the great causal body of the [[Great Divine Director]]. The Great Divine Director continues to sponsor the divine plan for the continent of Africa, even as he sponsors the divine plan for the descendants of Afra in America. The members of the “black” race have come forth on the blue ray and the violet ray. In an ancient civilization on the continent of Africa, the people’s skin actually had a blue or a violet hue. These colors come from the Father-Mother God, [[Alpha and Omega]], the beginning and the ending, the first ray and the seventh ray. Throughout the ages since his departure from [[Eden]], man has wandered from his high estate, and the pure colors of the rainbow rays are no longer reflected either in the skin tone or in the aura. Division has set in through the divide-and-conquer tactics of the [[fallen one]]s. Instead of the races embracing one another as brother and sister, there is division: one race enslaves another race, and the great unity of all children of God and their oneness in the flame is destroyed. Afra lived 500,000 years ago when the people of this ancient civilization had reached a crossroad. [[Fallen angel]]s who had invaded planet Earth divided the people. These evil angels set out to destroy the blue and the violet races. They distorted the once-sacred rituals and art forms of this people, opening the door to [[witchcraft]], [[voodoo]] and [[black magic]]. They turned the people toward hatred, superstition and a vying for power. As the people began to divert their attention from their [[God Presence]], they became more and more vulnerable to the divide-and-conquer tactics of the [[fallen angel]]s. The civilization became divided by the warring factions of its tribes. The people were losing the inner spiritual battle between the forces of light and darkness within them. And their division, both within and without, allowed them to become enslaved under the powers of darkness. As the people began to divert their attention from their [[God Presence]], they became more and more vulnerable to the divide-and-conquer tactics of the fallen angels. The civilization became divided by the warring factions of its tribes. The people were losing the inner spiritual battle between the forces of light and darkness within them. And their division, both within and without, allowed them to become enslaved under the powers of darkness. Seeing the plight of his people, Afra took embodiment among them in order to rescue them. First, he pinpointed the one missing trait that he perceived to be the Achilles’ heel of his people. He identified the point of vulnerability as their lack of brotherhood. Allegorically speaking, they followed the example of Cain rather than following the example of Abel. When the L<small>ORD</small> asked the people of Afra if they would be willing to lay down their lives for their kinsmen and friends, their answer was the same as Cain’s: “Am I my brother’s keeper?”<ref>Gen. 4:9.</ref> The one who answers no to that question is dedicated to his ego. He will never be his brother’s keeper, and eventually the divine spark within him, the threefold flame, will die.